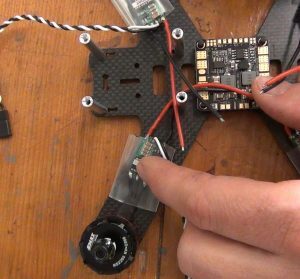 This is part 3 of our instructional series of how to assemble a racing drone. 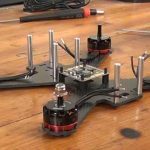 In this series, we are building a Lisam 210 frame and in this article, we hook up all 4 ESCs to the motors and the power distribution board. Check out the introduction post for more information about the series. 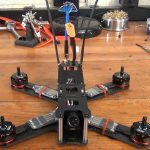 Your assembled racing drone frame (see part 2 of this series). 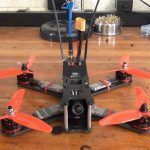 When we put together the parts list for this build, we tried to buy the cheapest possible components that could net a competitive racing drone. By and large this was a success – the Lisam 210 has been flying for about a month now and still flies just as good as quadcopters I have spent 3x the money on. 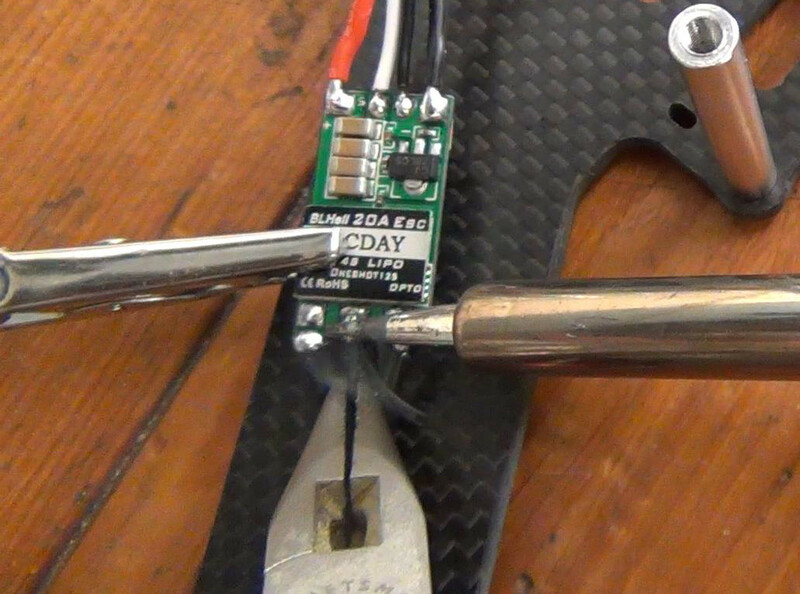 The big exception with our cost cutting was the “OCDay” branded ESCs. We figured since these were BLHeli speed controllers they would do fine – we were wrong. 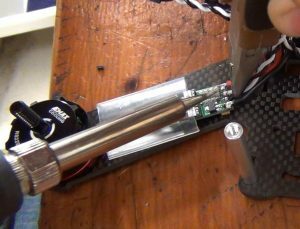 From the factory, one of the ESCs was defective – and actually burned out the windings in our motor as soon as it powered on. 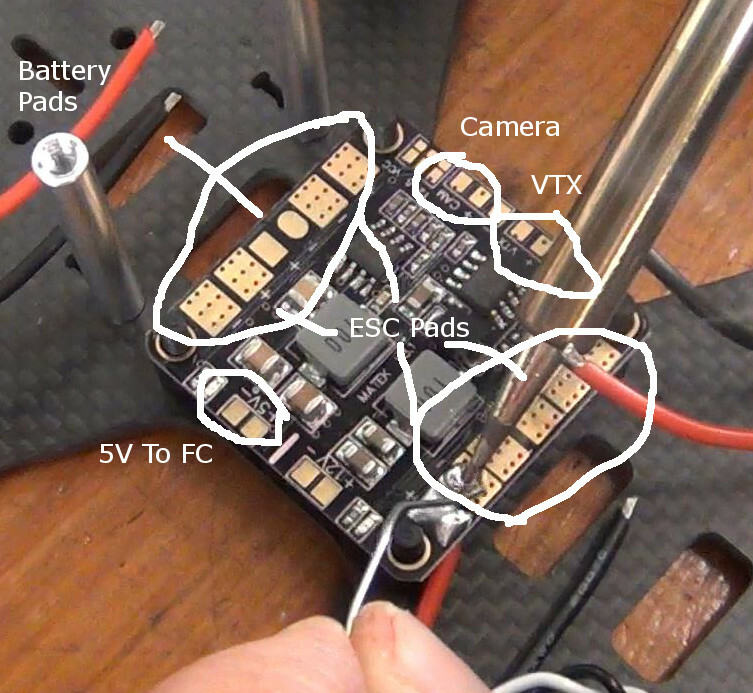 According to the forums, this is not uncommon with these ESCs. After wrangling with the OCDay ESCs post-build, we opted to swap in some Littlebee 30A ESCs we had laying around instead of risking further damage – and the quadcopter has been flying great since. While you will see pictures of us installing OCDays through the rest of this tutorial – the procedure for installing Littlebees, Racerstars, Aikon SEFMs, or even KISS ESCs is pretty much identical. Check out our ESC buyers guide for a list of great ESCs on the market. 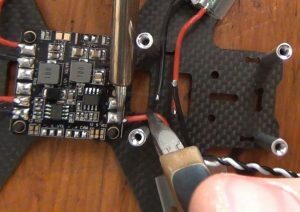 To have the cleanest build possible, you will need to do some prep work on your ESCs before you install them. That means you’ll need to get access to the circuit board of the ESC. Most ESCs come from the factory with protective covering that is wrapped around the ESC – this will need to be removed so that we can work on it. You want to be very careful when doing this – you can easily damage the ESC circuit board if you use too much force. Use a very sharp knife and consider heating it so that it cuts through the plastic easily. We like cheap, disposable hobby knifes. Apply very little to no pressure downwards – instead try to apply pressure only against the wrapping. Some people have suggested it is safer to cut along the side of the ESC – there are less ways to damage the ESC by cutting in this way. 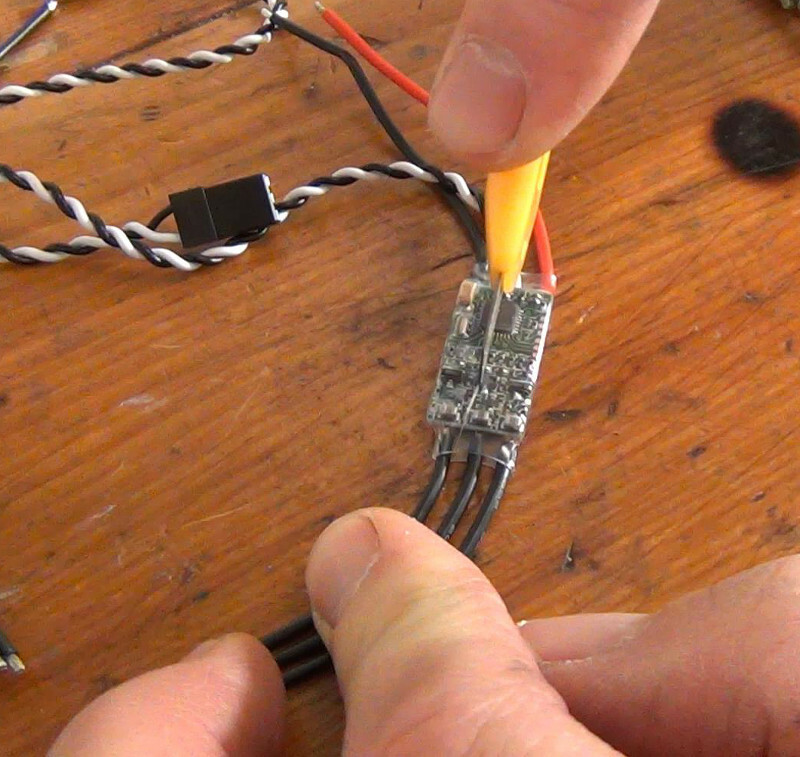 Power Wires – Pretty self explanatory – these provide power to the ESC and thus, motive force to the motors. They will be connected directly to the battery through the PDB. Red is always positive voltage and black is ground. 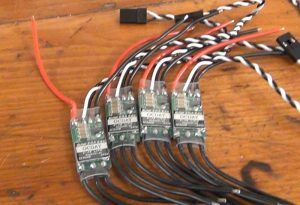 Motor Wires – These wires / pads are meant to be connected to the brushless motors on your quadcopter. They have no polarity or ordering – you can connect any of these motor wires to any wire on a motor. You just need to have all three connected to one of each of the motor wires. Signal Wires – These wires are used to control the ESC. Specifically, they are used to tell it how fast to turn. Therefore, they are connected to the brain of the quadcopter – the flight controller – which makes this decision. The white wire is called the signal wire, while the black wire is a ground wire. Some people omit the black wire altogether – which does actually work – but we do not recommend this. 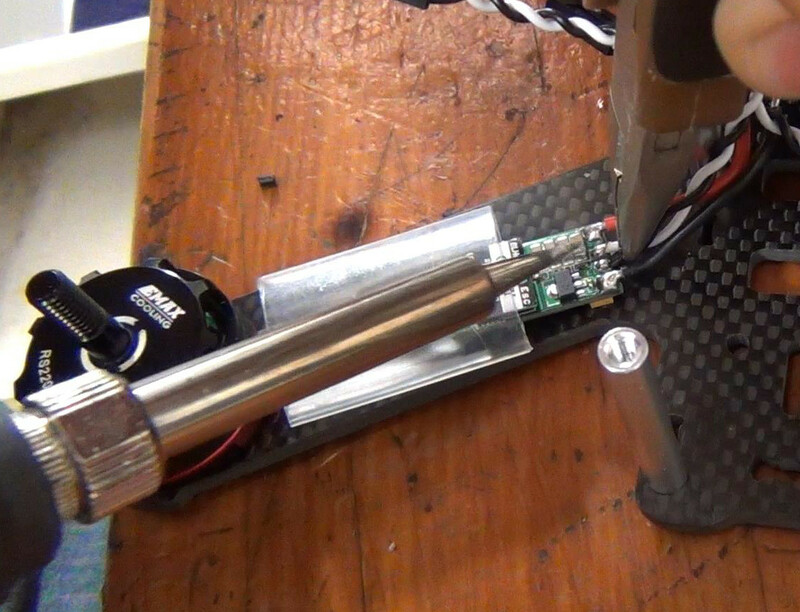 The first thing we like to do is hook up the ESC to the motors. We highly recommend you use the direct soldering method to accomplish this. In this method, we will be soldering the wires from the motors directly onto the motor pads on the ESC. This method has a ton of benefits over splicing these wires together or using connectors – including lighter weight, better looks and less complexity. Mostly, though, it is the easiest way to do the install and is also easiest way to make repairs once you become proficient at soldering. 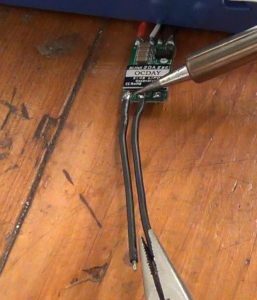 Use a pair of pliers to pull the motor wires – they can heat up pretty quickly while using the soldering iron and you don’t want to burn yourself. Use the highest heat and apply firm pressure with the soldering tip to make the solder melt quickly. Once you’ve removed all 3 wires on an ESC, move to the next one until you have 4 ESCs with no motor wires. Now that the ESCs have been prepared for installation, we’ll need to cut the motor wires to the proper length. You’ll do this by laying your ESCs on your quadcopters arms where you want them installed. 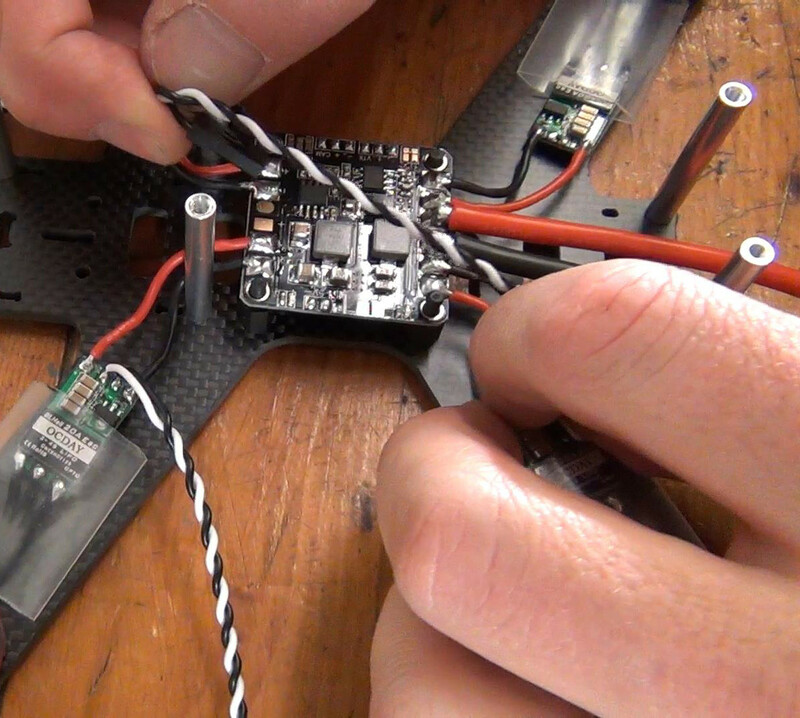 For beginners, we recommend installing the ESCs so that they rest about halfway down the arm. You may need to place the ESC much closer to the frame – this will be determined by how long your arms are and how long your motor’s protective wire sheething is (that’s the solid black heat shrink holding all 3 wires together in the picture below). We recommend having at least a centimeter of motor wires once you trim them. This will be a huge portion of the wires, don’t worry! These are miniquad motors and will almost certainly never be installed on anything else. All miniquads are built this way and thus you’ll always want your wires this short. Once the wires are trimmed to the proper length, repeat this process on the rest of the motors. We like to use a pair of calipers or a ruler to make sure we cut all the motor wires an identical length. Next up, “tin” the wire tips. If you haven’t read our soldering guide, “tinning” is the process of applying solder to a part. Simply heat up the tips of the motor wires with your iron and apply solder until they have a shiny silver appearance and it is difficult to make out the individual wire strands. Finally, install the wires onto the ESC. As we mentioned above, order does not matter here – only ensure that each wire goes to one pad on the ESC. Since the ESC is pre-tinned from the wires you removed and your motor wires were tinned in the previous instruction, you do not need to add any solder. 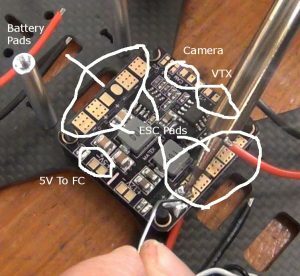 Simply hold the ESC in place with a pair of helping hands or something similar. Pick up a motor wire with a pair of pliers in one hand and your soldering iron in the other. 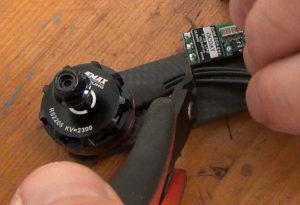 Lay the motor wire on top of a pad on the ESC and press the soldering tip onto the top of the motor wire, using firm pressure. Once the solder on both the ESC and the motor has melted (you should be able to both see it melt and feel the wire “settle” onto the the ESC board), remove the soldering tip but continue holding the motor wire onto the ESC until the solder dries. Repeat this process for all the other wires so that you have all your ESCs attached to all your motors. One down, 11 to go! 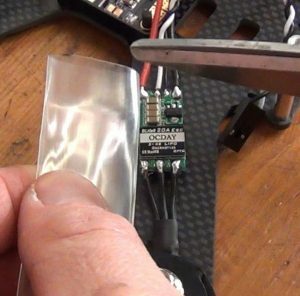 If you are going to be using heat shrink to protect your ESCs, now is the time to cut that and place it around your ESCs. 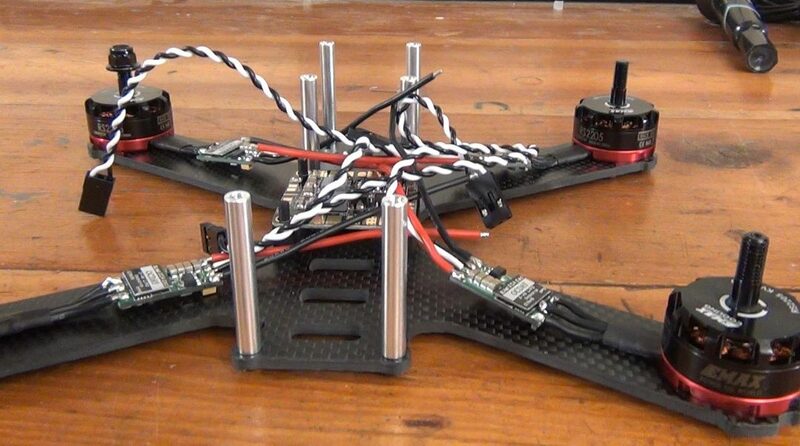 We like leaving our heat shrink un-shrunk until the quad is first powered up. That way if any additional soldering work needs to be done you do not have to cut the shrink off and waste it. Some people like to use electrical tape instead of heat shrink. This works just fine and you can skip this step if you are using that. If this all confuses you, we highly recommend you check out our PDB buyers guide – which goes into detail on the different components on most PDBs and what they are used for. Before you can solder anything to the PDB, it needs to be tinned. While you’re at it, you might as well tin every pad on the PDB you are going to be using. In our case, that means not only the ESC pads, but the battery pads, the 5V pads used for the Flight Controller, and the dedicated pads for the camera and video transmitters. If you don’t know what you’ll be using yet (we’ll touch on that a bit more in later parts) – just tin the battery pads and the ESC pads. 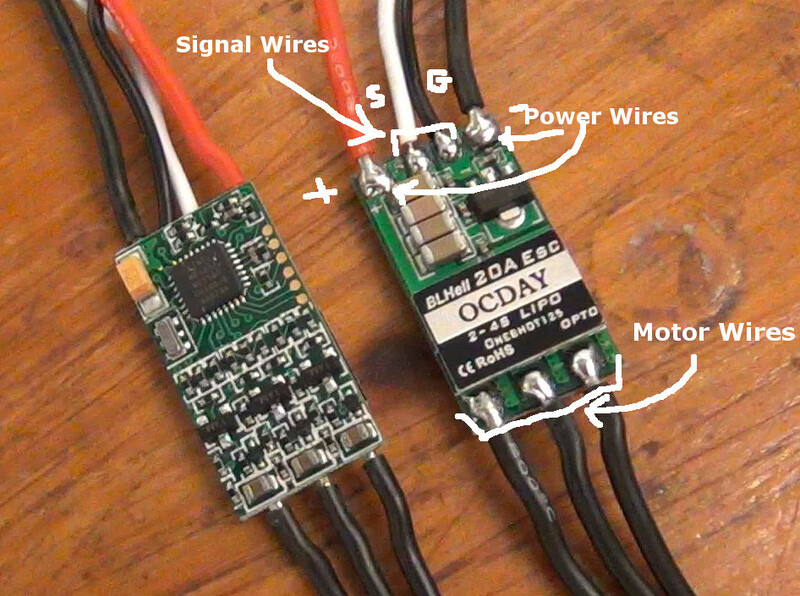 Now, take the positive and negative power leads from your ESC and route them to their proper locations on the PDB. You’ll want to make sure all wires coming into the PDB are routed either from the front or from the rear – coming in from the sides leaves wires vulnerable to getting chopped up by props or torn off by twigs and branches in crashes. Once you’ve figured out how long you want the wire, cut it so that you have about 2cm of excess wire. You always want to have a little bit of play in these wires so you can remove the PDB and do some cleanup later in the build. With the cut wire, strip off about 1-2mm of wire insulation and tin the wire – all of this should be just like what you did with the motor wires when soldering them onto the ESC. Finally, solder the power wires down to the PDB. Red wires go to the positive (+) marked pads, black to the negative (-) pads. The last step is optional, but doing it will clean up your wiring harness and make your whole build look a lot better. You may have noticed that the ESC signal wires are the only remaining wires that are way too long. One option to fix this is to zip tie a couple of loops into the wires to get rid of the excess. On smaller quads like our Lisam 210 this isn’t a great option because there simply isn’t room for errant wire bundles. 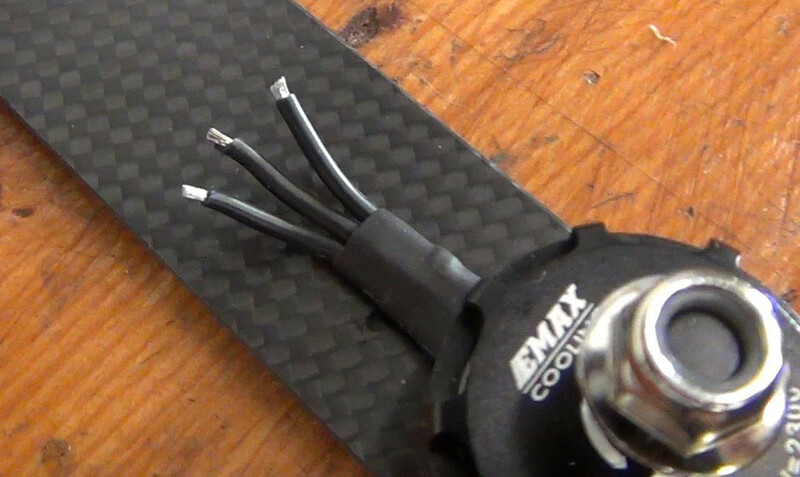 Since the ESCs are still uncovered, now is a good time to trim these cables back. The trimming process starts with determining how much wires you need. 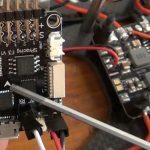 Do this by putting your flight controller on top of the PDB where it will ultimately sit and measuring out the amount of signal wire you will need to reach the desired port on the flight controller. Make sure you situation your flight controller in the right orientation – most flight controllers have an arrow on the board which should face forward. Once you measure the length you need, add a centimeter or two onto it so it isn’t too tight and snip the excess wire on the ESC end. This should leave you with a signal cable cut off that is the exact length you need. Next, remove the now connector-less wire from the ESC by quickly touching your soldering iron tip to the pad on the ESC where the wire connects. These are small wires and should not need more than 5 seconds of heat to remove. Now, strip and tin about 2mm of the end of the signal cable you cut off with the connector on the end. You’ll be soldering this back onto the ESC – thereby re-adding the significantly shorter signal cable back onto the device. Finally, reinstall the wires by soldering them down to the ESC. Reference the other ESCs to make sure you put the wires in the correct place – the white wire where it originally came from and the same with the black. This completes the ESC installation. Your drone racer now has the entire power system installed and ready to go. Next up, we’ll make it flight ready by installing the flight controller and radio receiver.